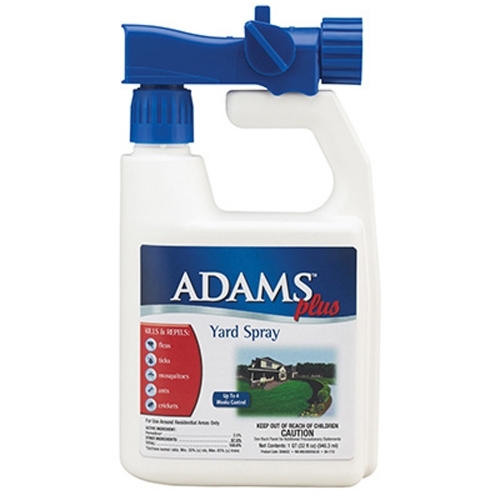 Adams Plus Yard Spray – Emulsifiable concentrate for use with a hose-end sprayer kills and repels fleas, ticks, mosquitoes, ants, crickets and many other outdoor insects for up to 4 wks. Also kills Brown dog ticks and deer ticks which may carry Lyme disease. 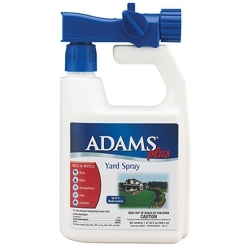 For use around residential outdoor areas including lawns, trees, shrubs, roses and flowers. Contains 2.50% permethrin. With hose-end sprayer, 1 qt treats 5,000+ sq ft. For conventional sprayers, mix 6 oz in 10 gal water to cover 1,000 sq ft. Apply as a thorough cover spray. Do not apply to animals.